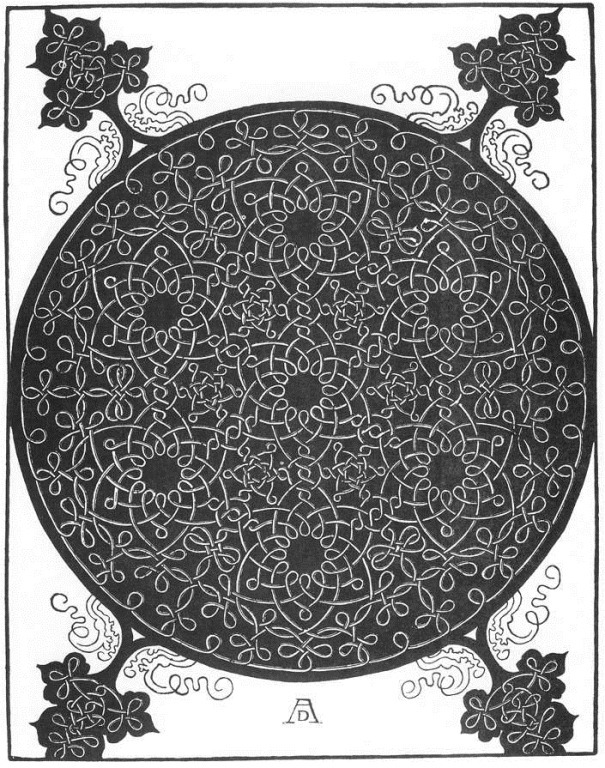 Albrecht Dürer “Pattern from the Series of Six Knots #4” 1505-1507, woodcut. Giovanni Pico della Mirandola was a man of the Renaissance that followed the Middle Ages that followed antiquity. During the Middle Ages the church did its part to obscure the classical ‘pagan’ thinking to be replaced with Christian theology that un/knowingly retained rational & mystic affinities. The Renaissance is then said to be a ‘re-birth’, a re-examining & falling in love with Classical antiquity, with it’s great minds like Plato & Aristotle. Neoplatonism brought about a religious fusion of Christian & ‘Platonic’ ideals maintained long before the transformations of the Renaissance, then summoned into a new life by scholars like Pico who relied on an abundance of philosophical texts. His vast library included newly translated works of Plato & the mystic Hermes Trismegistus, along with many books of the Neoplatonists (all of whom had not been translated to Latin till then) by his contemporary Marsilio Ficino. Classical ideals took on fresh vitality for the arts, architecture & philosophy during that transformative time. The specific embrace of Greek philosophy is known as Humanism, which is why Pico is known to us as a Humanist. He was no longer strictly looking to the attitudes of the Medieval afterlife, but also to a disciplined & reasoned life on earth, looking for man’s willful place in the cosmos, trying to outline man’s universal capacities, man’s contemplative relationship with God, the angelic order & himself. A perfect synthesis of all religions wouldn’t come easily & Pico’s ideas extended far beyond what the Neoplatonists offered. Yes, Pico was a humanist, but he was much more than that. He was a multi-lingual Renaissance-wunderkind, he wrote in many languages, but most of his work is written in Latin. Legend has it that a startling ring-of-fire appeared to his mother when he was born in 1463, this was seen a portent for her child’s life of enlightened brilliance. It must be said too, that Pico’s elaborate complexity ends & starts with Christianity, in fact he ended up in the zealot Savonarola’s company before his death in 1494 in his early thirties, some think he was poisoned. Pico’s thought is Christian, it included the Neoplatonist ideas of Plotinus, Pseudo-Dionysius the Areopogite, Iamblichus, St. Thomas Aquinas, add to these: the Kabbalah, Early Islamic thinkers Avicenna, Averroes, the hermetic Hermes Trismegistus & countless others. Whether or not we can call Pico’s ideas entirely syncretic or ecumenical is controversial, but he was an amazing enigma & even deemed heretical By Pope Innocent VIII in 1486. This charge of heresy was nailed on Pico’s 900 Theses. In this work the audacious blending of all the aforementioned philosophies are in a proposed unity, of course, as all unified under the perfection of God, while centralizing man’s place in the world. Man as a confluence of all wisdom before him. Man as capable of finding a disciplined relationship with his religious/philosophical practice, rigor & intellect. Connected to the 900 is his famous Oration on the Dignity of Man. It is not clear if this was an written as an introduction,or part of an apologia for the 900. But upon man, at the moment of his creation, God bestowed seeds pregnant with all possibilities, the germs of every form of life. Whichever of these a man shall cultivate, the same will mature & bear fruit in him. ―Pico Della Mirandola from the Oration. Only a handful of his books were published during his short lifetime, there is the Heptaplus published in 1489 which Pico set out to carefully elaborate on the Biblical story Of Genesis, done with a mixture of Moses & all the rest of Pico’s trademark inclusions of western theology, Neoplatonic philosophy & Hermetic mysticism, rolled into a seven part allegorical story of creation. This text too, was pronounced heretical. Within Pico’s Heptaplus cosmology we have an emphasis on three categories: man’s corruptible body on earth, the intelligences of the 3-tiered angels (Seraphic, Cherubic & Thrones) & the heavenly celestial bodies. This angelic realm is particular interest & is derived partly from Dionysius the Areopogite’s ‘angelology’. 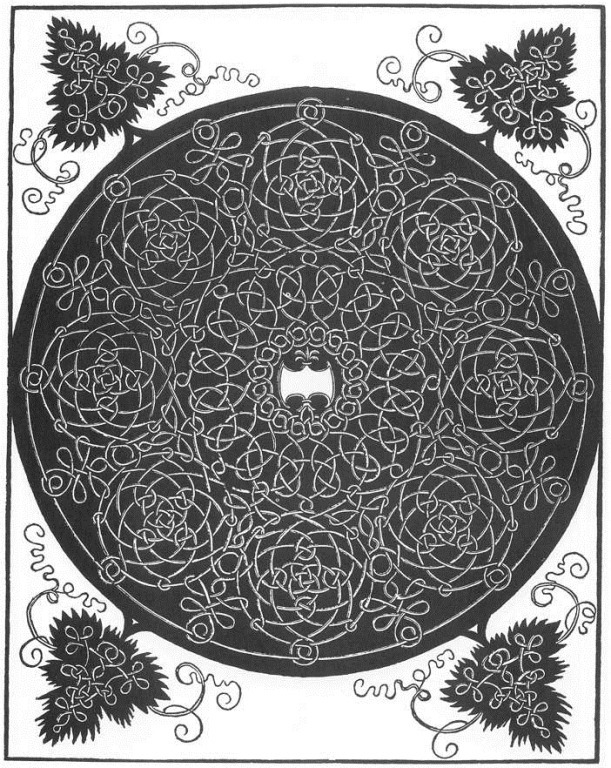 Albrecht Dürer “Pattern from the Series of Six Knots #3” 1505-1507, woodcut. the term theurgy help us establish this? on the relationship of Dionysius to NP), Pico doesn’t mean theurgy by magic. grimier conjuring magic. Pico rules this out in Oration and Apology. in Reuchlin, but I don’t think that’s a good description of what Pico’s doing. original solution to the problem of Deification. for magic he’s clearly going there to develop the Christian NP angelology. of Aquinas+Platonism to work on Pico and solve problems understanding him. With this we’ll observe the problematic nature of Pico’s project & how certain branches of his all-encompassing system have become tangled over centuries with how he’s interpreted, how he’s read. ‘Magic’ has long been attached to the Hermetic/Kabbalistic mystical traditions & whether Pico uses these as out-right magical summoning, Hand questions this view & he urges us to look at Pico’s angelology through Aquinas who had his own advanced take on the intellect of the angels. That the angels represented a higher intellect than man is similar to what Pseudo-Dionysius believed. This ritualistic summoning is also key element in how the Neoplatonists practiced their faith with the contemplation, prayer, the invocation of God’s hierarchies &c.. Facing Pico’s texts we are forced to ask: Was he a magician, did he practice the ‘black arts’? Probably not, Hand assures us. Could these questions have a part in how his ideas have been obscured due to the ways the church obliterated any such pagan, eccentric & mystical arcana as it related to Pico’s particular form of his eccentric Christianity via the mystics et al? …probably, yes. Pico’s Heptaplus contains his original theory of esoteric hermeneutics. In one section, he uses this allegorical reading method to discover the angel metaphysics of Dionysius in Genesis. His version of Dionysius betrays the influence of Aquinas–especially his discussions of active and passive potency, concrete vs. abstract being, and participation metaphysics. Pico discovers many of the scholastic ideas about angels using clever allegorical moves inherited from Proclus and Dionysius (see Crofton Black’s book), but we also see him applying his original approaches from Commento and Oration/900 Conclusions. There may be a mystical-magical Pythagorean significance to Pico’s discussion of the angel as Number, but it also makes sense in terms of the Neoplatonic ontology of Number in Proclus. It seems that rather than some magical-numerological motivation, Pico compares the angel to Number in order to make a metaphysical point about the theological concept of perfection. Heptaplus consistently develops Pico’s theme of “becoming angelic,” but here placing more emphasis on the limitations of man based on his position in the hierarchy. But he ends Heptaplus with a mystical goal beyond that of becoming angelic–the Imitatio Christi. This is his practice of Poetic Theology. It is not a mere excuse to infuse the cosmos with angelic power for magical purposes aimed at self-aggrandizement. In Pico’s brilliant little treatise De Ente et Uno or “On Being and the One” he only brings up the angel to contrast it to God’s perfection. Building on his model from Heptaplus and Commento of the angel as the highest and most perfect created thing, Pico proceeds to contrast this perfection to that of God using negative theology. In Chapter 5 Pico explains the negative theology of Dionysius, taking into account the Thomistic developments in Christian medieval scholastic philosophy (but not bringing in his Thomistic criticisms from the 900 Conclusions) in order to shed more light on the difficult doctrines of Dionysius. He ends the De Ente with an explanation of how these metaphysical solutions help us in the project of imitating the divine, but here he has proceeded from angels and Christ to the imitation of God. Here it is clear that he follows the Thomistic caution, in interpreting Dionysius, to make clear that although one is “becoming one with God” in a mystical sense, this does not violate man’s position in the hierarchy. In the Disputations against Astrology, Pico’s most clearly anti-occult and non-magical text, Pico mentions angels to insist that we should see the Angelic Hierarchy, which is above man, as the source of the important influences, rather than planetary bodies which should not be seen as influencing souls. 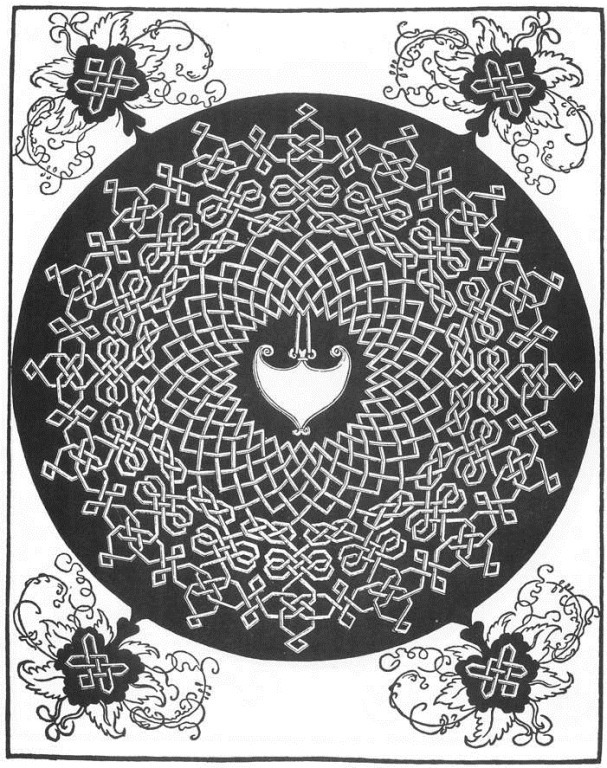 Albrecht Dürer “Pattern from the Series of Six Knots #1” 1505-1507, woodcut.